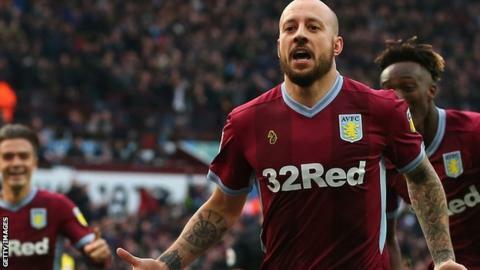 Aston Villa midfielder Jack Grealish said he was "over the moon" for team-mate Alan Hutton after his brilliant solo goal in the Second City derby. The full-back ran from his own half and beat three Birmingham players before scoring Villa's fourth in a 4-2 win. Grealish told BBC WM: "I thought his goal at Hull (in August) was good but that was unbelievable. "I thought Craig Gardner was going to give him a little kick but he carried on and obviously it was a great goal." He added: "I know how much it means to him and he has been a great servant to this club. I'm over the moon for him." The goal has been widely shared on social media, with some fans joking that it was reminiscent of Diego Maradona's mazy dribble for Argentina against England in the 1986 World Cup. The Scottish defender, who had not previously scored at Villa Park for four years, admitted he had not intended to go for goal when he first picked up the ball. "My mind was made up for me just with the way things opened up," he said. "To be honest I didn't realise how deep I was when I picked it up. I think it was Gards (Craig Gardner) that I got past and then I was going towards the back four they seemed to step off a little bit and it opened up and I thought I may as well have a shot." Hutton, who joined Villa from Tottenham in August 2011, has made 160 league appearances for the Championship side. He endured a difficult time at the club when Paul Lambert replaced Alex McLeish as manager in 2012 and was loaned out to Nottingham Forest, Real Mallorca and Bolton in a two-year spell where he did not feature for the club. However, he fought his way back into the side in August 2014 and signed a new one-year contract extension in June. Nicknamed the Scottish Cafu by Villa fans, the 33-year-old says he is grateful for the special bond he has with the club's supporters. "I've been here a long time now and I've had some ups and downs, but I'm really happy with my football and how things are going at the moment," the former Rangers man said. "I'm just like Jack (Grealish) and the other Villa boys because I've been here that long that I feel like I'm part of it, so to score in the derby is an amazing feeling. "I've been here a long time and I've got a connection... I don't know how to explain it. I get goosebumps when I'm out there and they're singing my name and things, especially going through bad times and coming back. I'm just glad to be here and playing my football here."